The Promised Neverland Vol. 8 Review – AiPT! Shonen Jump series don’t get much more consistent or exciting than The Promised Neverland. Kaiu Shirai and Posuka Demizu’s action-mystery manga is getting more attention than ever now that the anime adaptation has started, and it’s great to see. The manga’s latest tankōbon edition, Vol. 8, is out this week. Emma, Ray, and the Nameless Geezer’s expedition to Goldy Pond ends unexpectedly with Emma getting kidnapped by poachers. When she awakens, she finds herself in a cute and colorful town full of other children– who must soon run for their lives. That’s right, we’ve reached the Goldy Pond arc! There’s new antagonists aplenty here, as well as new allies in Emma’s struggle for survival. Are they introduced effectively? Does this arc get off to a good start? One of my favorite aspects of this series has always been Demizu’s art, and she continues to stun here. There’s just so much that she does exceptionally well with both creativity and sheer technical skill. The tiny details throughout this volume accomplish a lot, from the textures to the shading. Pages taking place in the forest are especially moody. The shadows look great, as Demizu perfectly captures the look of light cascading down from above the treetops. The tiny striations of bark on the tree trunks also help make the world feel believable and easy to get immersed in. The variety in page compositions is also great, as Demizu chooses layouts and perspectives that effectively match all manner of scenes and prevent the volume from ever feeling static. All in all, I have no complaints about this volume’s visuals. The writing here is also awesome. The pacing throughout is on-point, as the series continues to deliver effective suspense. The breakneck speed at which Emma finds herself thrust into life-or-death struggle at Goldy Pond helps emphasize just how dangerous this manga’s world is, and how there are more and more terrors around every corner. Shirai and Demizu also do a great job connecting new plot developments to past hints as well as foreshadowing later reveals. I can’t say too much without spoiling later volumes, but if you’ve kept up with the series weekly then you’re likely to see some details in a different light upon rereading. All in all, the worldbuilding is flawlessly done and leaves one eager to find out more about what the hell is going on. Of all the characters introduced here, my favorites are easily the villains. Goldy Pond is a secret hunting ground for the aristocracy, where wealthy demons who miss the thrill of hunting can kill human children for sport. As important as the existence of demons has always been to the series, we’ve seldom seen any that actually have names and unique personalities. The greatest of them all is Leuvis, who doesn’t like hunting weak and scared prey. He wants a rival who’ll give him a challenge, and Emma’s more than up to the task. Bayon, Nous, Nouma, and Luce also make good first impressions, and their designs are all stellar. All this development of demons as actual unique characters is one of my favorite parts of the arc. 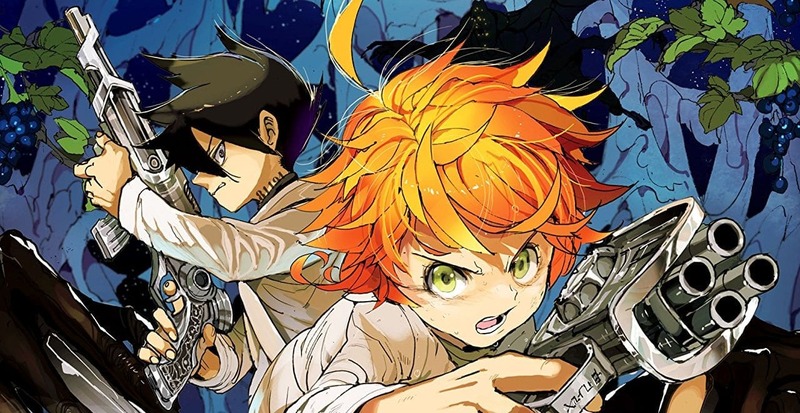 The Promised Neverland is one of the most popular series out there right now, and this volume makes it easy to see why. The worldbuilding is great and a number of great new antagonists get introduced. The visuals also stun, as Demizu delivers some of her strongest work yet. There’s really nothing here that I wish was improved upon or done differently; this was my top ongoing manga of 2018 for a reason. The Promised Neverland is one of the most popular series out there right now, and this volume makes it easy to see why. The worldbuilding is great, and a number of great new antagonists get introduced. The artwork also stuns, as Demizu delivers some of her strongest visuals yet.